Samsung has crippled its new Galaxy Note 3 by adding region-locking, making buyers of unlocked units attempting to use it in geographies outside of the area in which it was purchased subject to exorbitant roaming fees. "We wish to make our customers aware of certain functionality limitation regarding SIM cards on the Note 3. The Note 3 will work with any UK or European SIM card." UK "specialist provider of mobile technology products" Clove notes on its Note 3 order page. 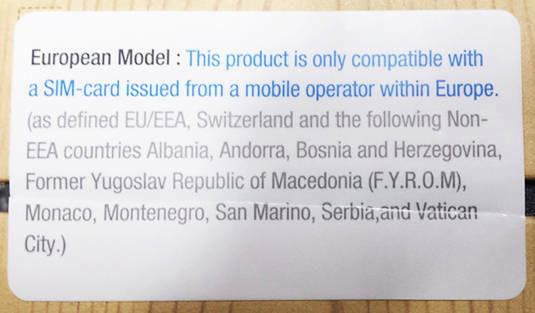 "If you travel internationally (outside of the Europe [sic]) and usually insert a local SIM card when in the country," they continue, "the Note 3 will NOT be able to use the local network. It will loose [sic] all mobile connectivity with the exception for emergency calls." Because of this region-locking, Clove notes, if for example you're in the US and want to use a US-based SIM card, you'll be S.O.L. if you want to make a voice call, send a text message, or make a mobile data connection – you'll be limited to Wi-Fi only. As GigaOm correctly notes, this region-locking is doubly troubling due to the fact that the Note 3 is a GSM-based handset, and the "G" in "GSM" stands for "global". Not to Samsung, it appears. While it's possible that carriers leaned on Samsung to add such a "feature" in an attempt to preserve their roaming-rate extortion revenue streams, such global cooperation seems unlikely to us here at The Reg. Instead, we're betting that Sammy is more interested in preserving its ability to manage price differentials in different geographies.